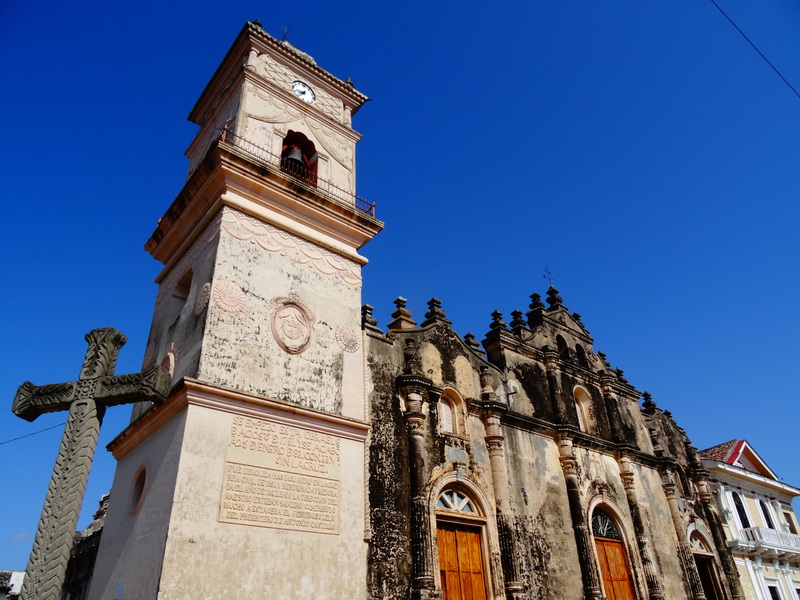 On a weekend in April, I decided to pack my little backpack and set off for Granada – a pearl of Nicaragua. Granada is the oldest colonial city in Nicaragua and located on the north-west side of Lago Nicaragua (also called Lago Cocibolca), which is the biggest lake in Nicaragua and the second-biggest lake in Latin America. 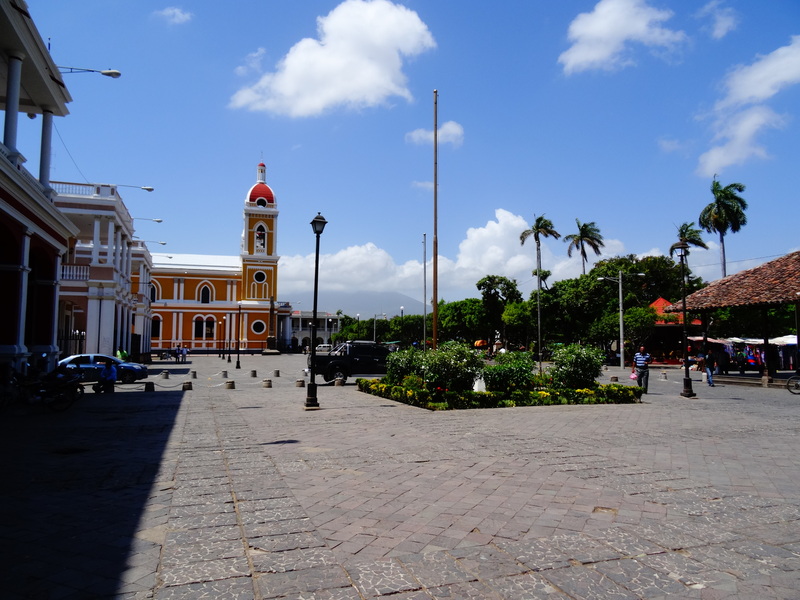 Granada is an important tourist hot-spot in Nicaragua, and there are many things to see and to do. Just walking through the streets and passing by colourful colonial buildings, numerous gorgeous churches, fountains, the parque central, the view to the volcano Mombacho, which you can see from almost every angle of the city, the Isletas in the lake, close to Granada and the vicinity to a great volcanic lagoon, called Laguna de Apoyo, convert a trip to Granada into a very special adventure. At around 3 p.m. I started my journey with a “ruta” (rebuild transporter which serves as public transportation within cities) to the bus station of León (4 C$, about$ 0,18), where the buses to Managua start. 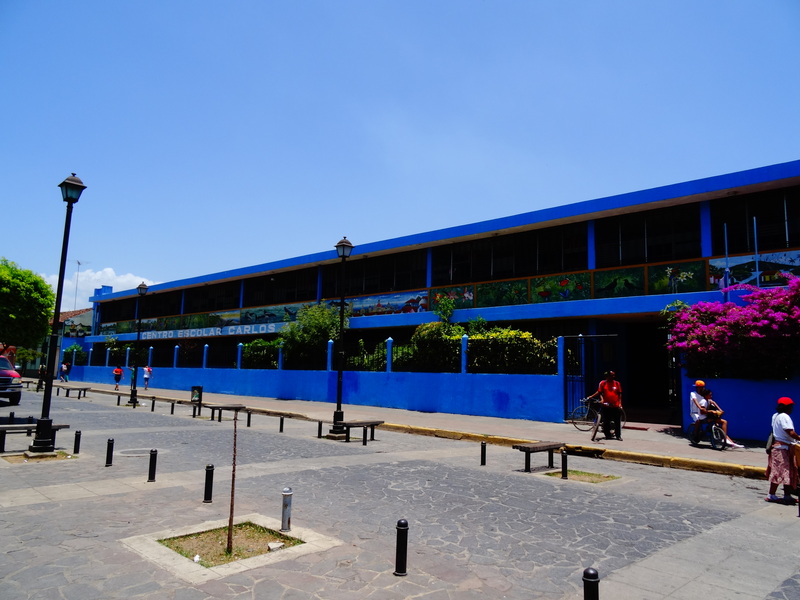 Make sure that you are taking a minibus to the UCA station in Managua, otherwise you will have to change bus stations within Managua, in order to get to Granada. 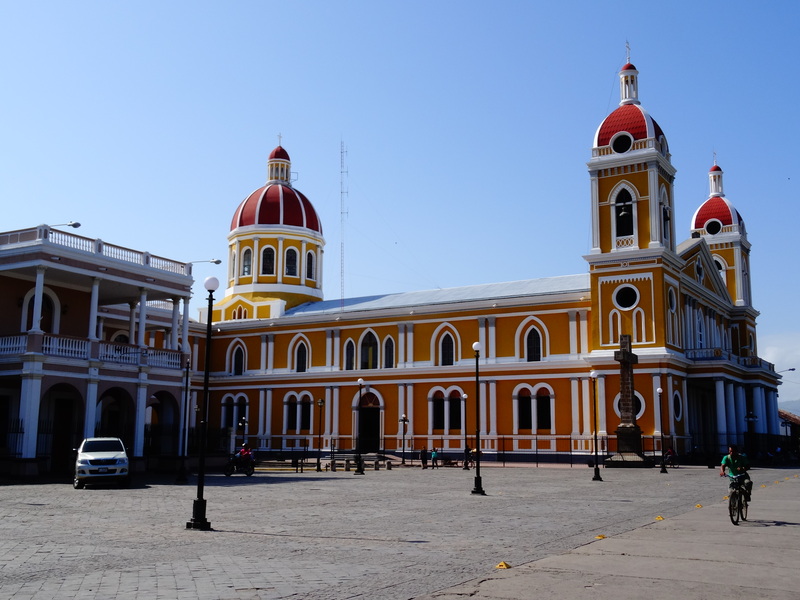 From Managua to Granada, I took an overcrowded Bus for 25 C$ (= $1) to Granada. The journey took about 3,5 hours. On the bus, I met Chris from Germany and Candis from Canada. They also met on their journey and asked me if I wanted to join them. Since we all hadn’t booked accommodation yet, we looked for a hostel together. 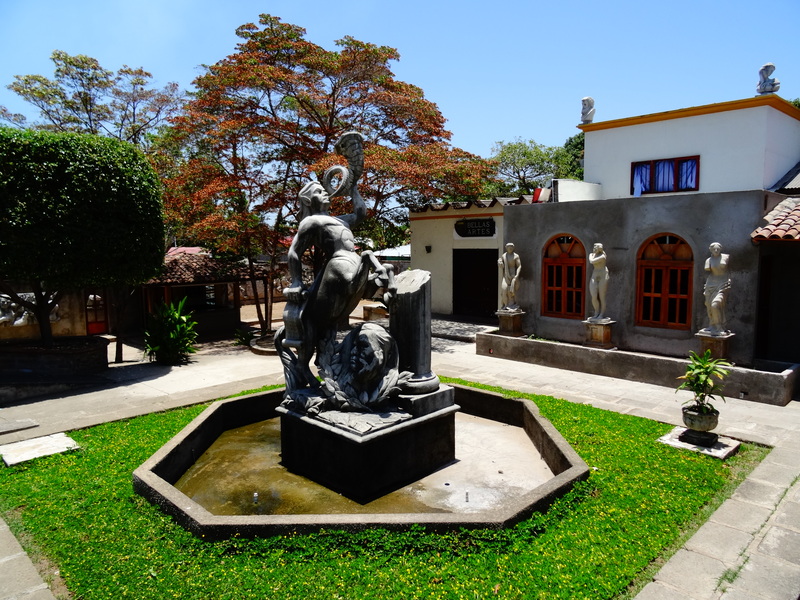 It´s very practical that the buses are drive directly to Parque Central (Central Park), which means that you land directly in the heart of the city, and that the hostels, restaurants, cafes, etc. are in walking distance. Directly beside the church La Merced at Calle Real, we have found a nice hostel, which is a rebuilt colonial farm house. It is called “De Boca en boca” and we paid for a bed in a nice and clean dorm room at just $5 per person. Wifi is included, bathrooms are shared and breakfast is 100 C$ (about $4). We were all quite hungry, so we went to a local restaurant that offered a buffet with different things: rice with beans, fried banana, salad, cheese, meat – you can choose what you want. We all drank Toña Beer. In total I paid 100 C$ (about $4). I realised that the food in Granada was quite expensive. More expensive than I am used to in León. But I guess that´s because Granada is a popular tourist hot-spot. The following morning we went to Kathy´s Waffle House, because it was recommended in every travel guide and also the lady from the reception of our hostel recommended us this café for breakfast. But I was not very convinced. The food was unfortunately quite expensive and not that special. In total, I paid 150 C$ ($6) for a pancake with bananas and coffee. In the evenings, we went to Calle La Calzada for eating. 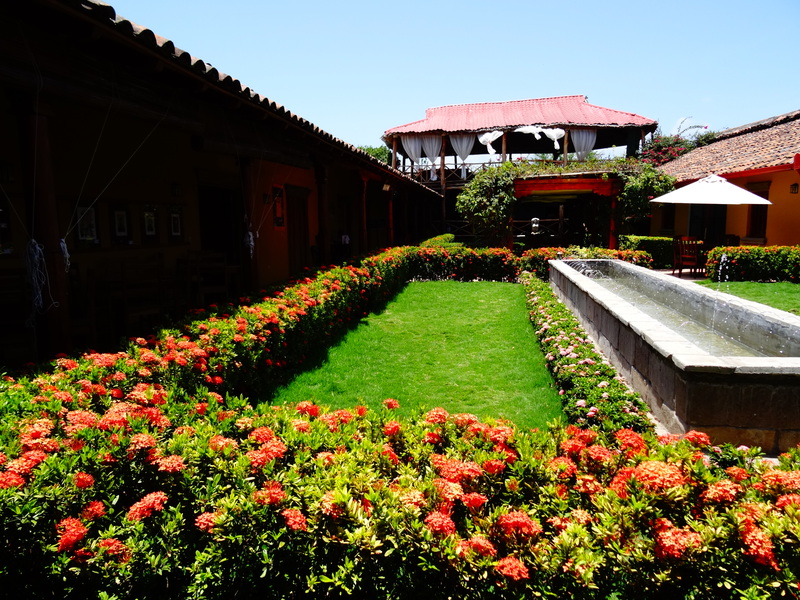 Here you can find many different restaurants and cafés with Mariachis playing in the evening. 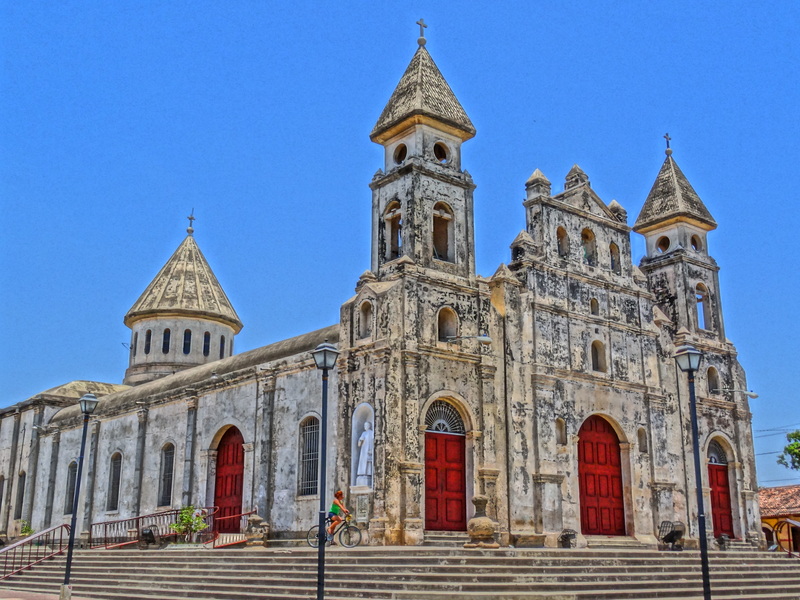 Directly on the opposite of Kathy´s Waffle House, you can find the beautiful church San Francisco. 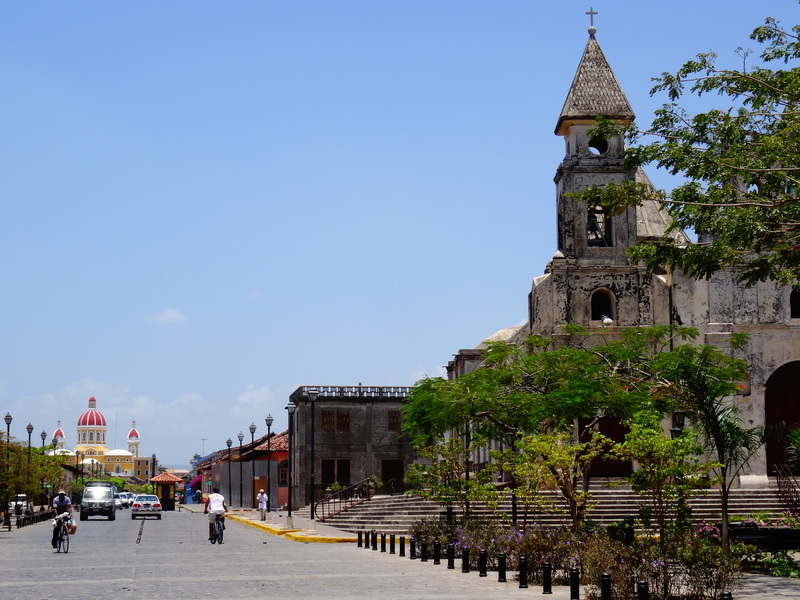 The church is located just some blocks northeast of the Parque Central and was constructed shortly after the foundation of Granada. 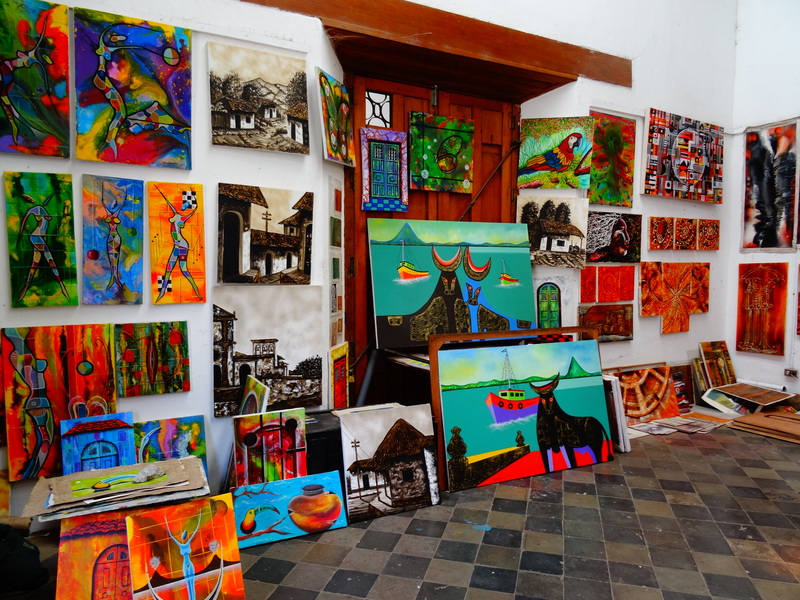 There were many different colours on the streets of Granada. The following pictures will show you what I am referring to. 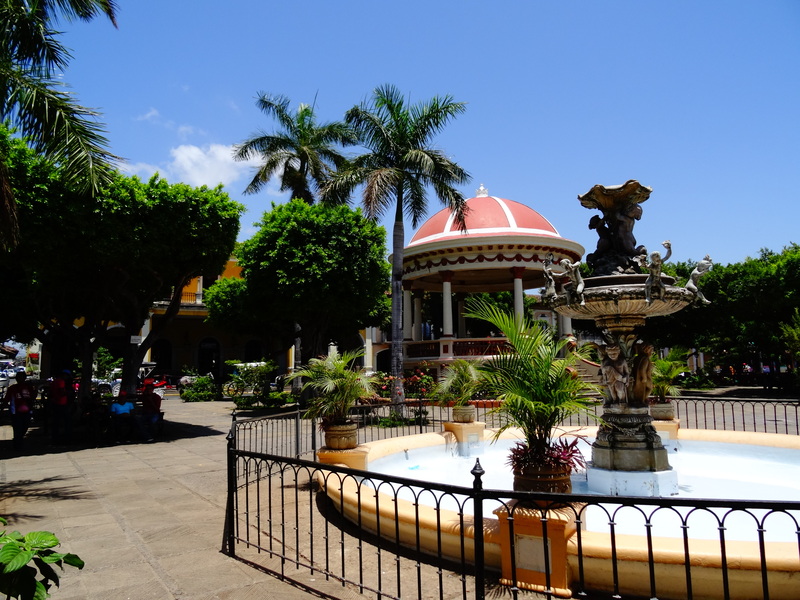 The Parque Central looks amazing with its trees and flowers, the fountain, pavilions, the street market, the surrounding colonial houses and the majestic cathedral. 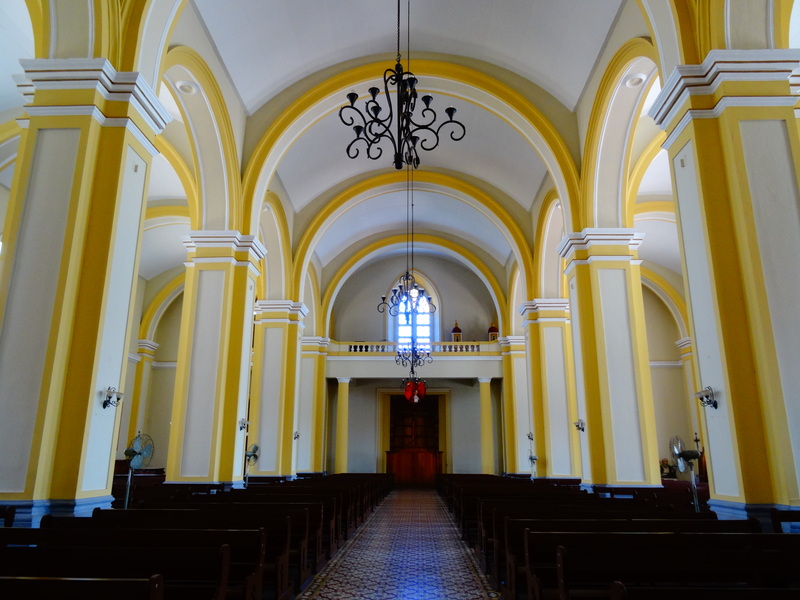 On the way to the promenade, on the street La Calzada, we passed by the very magic looking church Guadalupe. 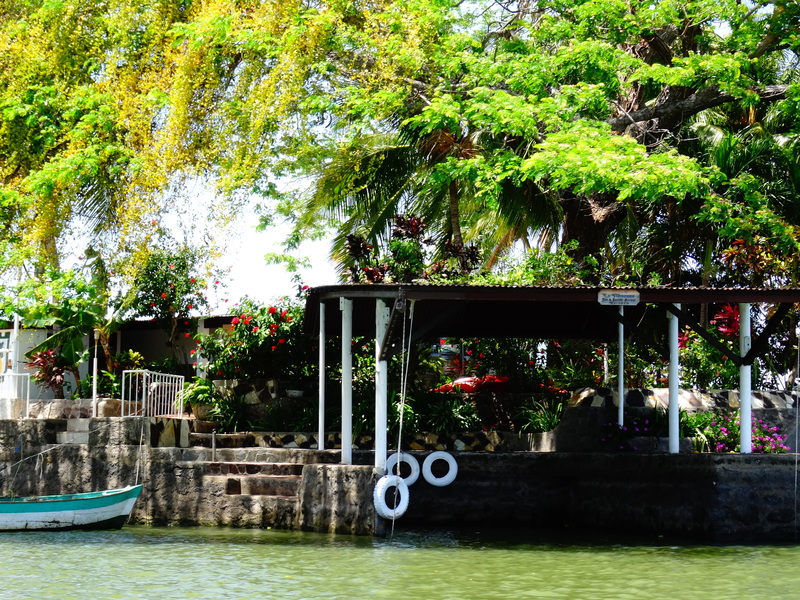 When we reached the promenade at Lago Nicaragua in Granada, a guy asked us if we want to take a boat tour to the Isletas archipelago in the lake (2 hours for $10 per person). We knew that we could not get it cheaper elsewhere, so we agreed and went to a little dock, where we set off to the Isletas in the Lago Nicaragua. 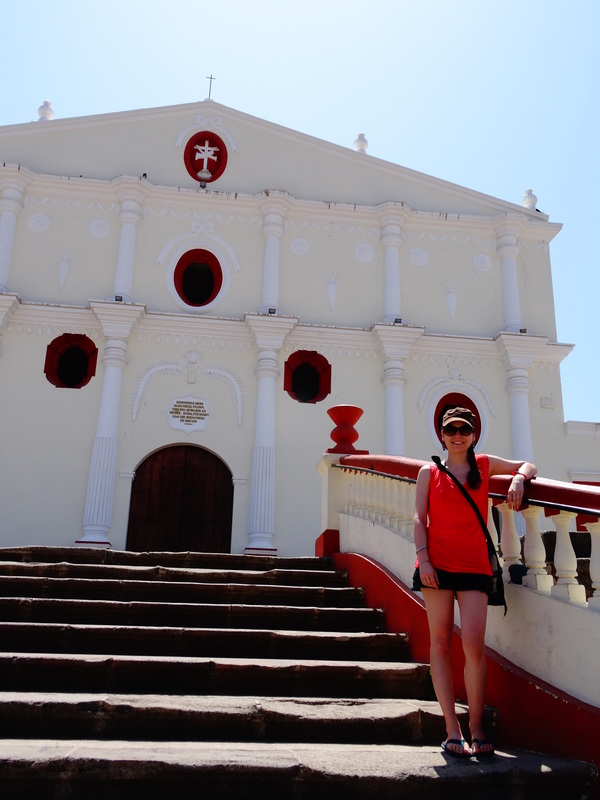 After we came back from our tour to Las Isletas, we went for about $1 up to the roof of the church La Merced. It´s absolutely worth it to spend that dollar because you can see the whole city, including a nice view to the lake and the volcano. 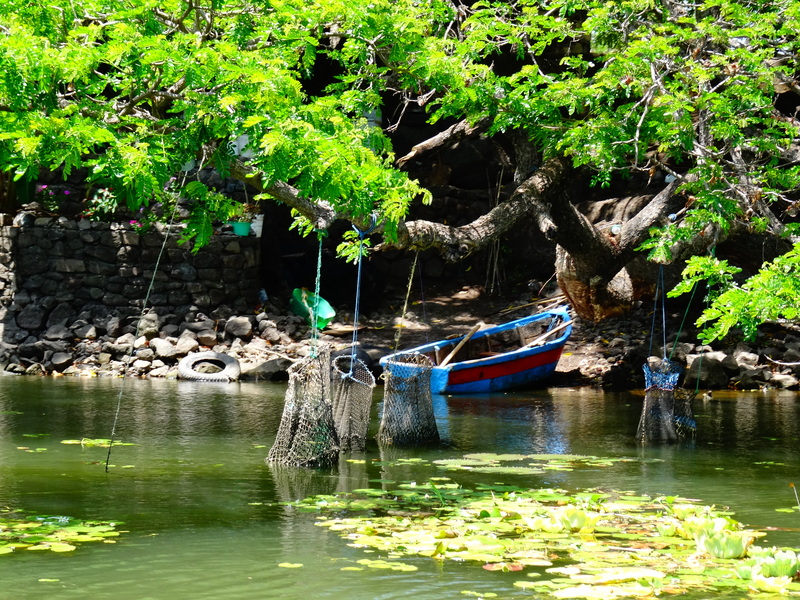 In the warm waters of Lake Nicaragua (also called “sweet ocean”) is the group of 354 islands that were formed by an eruption of the volcano Mombacho thousands of years ago. 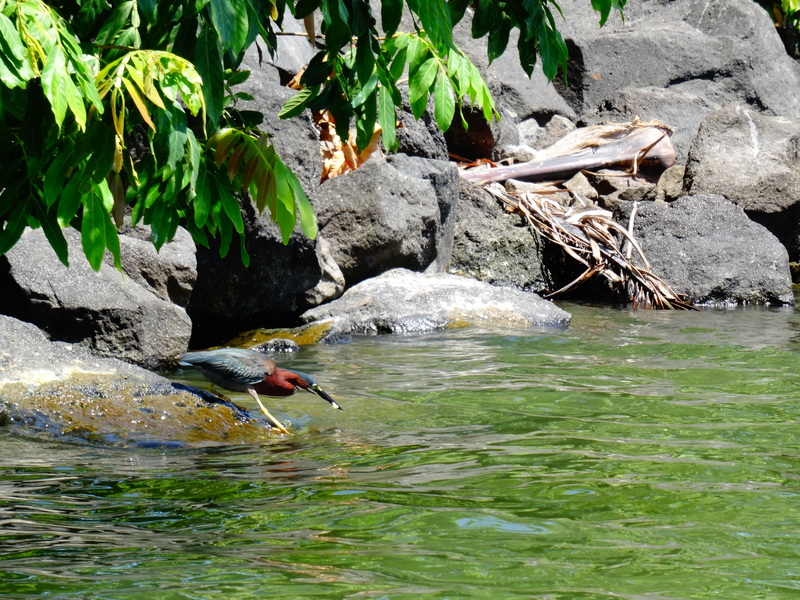 Most of the islands are covered with lush vegetation and rich animals, including birds and monkeys. Some of the islands are occupied and privately owned. On some are private houses, on others restaurants or even hotels. We started our boat tour – just the three of us and a driver, who explained some things. The area was really beautiful, like a little peaceful paradise! It was quiet, birds were flying around or in the water, now and then a boat with fishermen came by and we had a nice view of the volcano Mombacho. A guy with some cows was crossing our way – swimming! One island with a house built on it was even for sale. It costs only $200,000. Not bad, huh? We asked our driver if we could stop on one island to grab a drink. It was not even more expensive than in the city – for a papaya juice I paid 25 C$ ($1). The following day, Chris and I went to the Laguna de Apoyo. This lagoon, which is 48 square-kilometres, contains very clean and clear water inside the crater of the Apoyo Volcano. 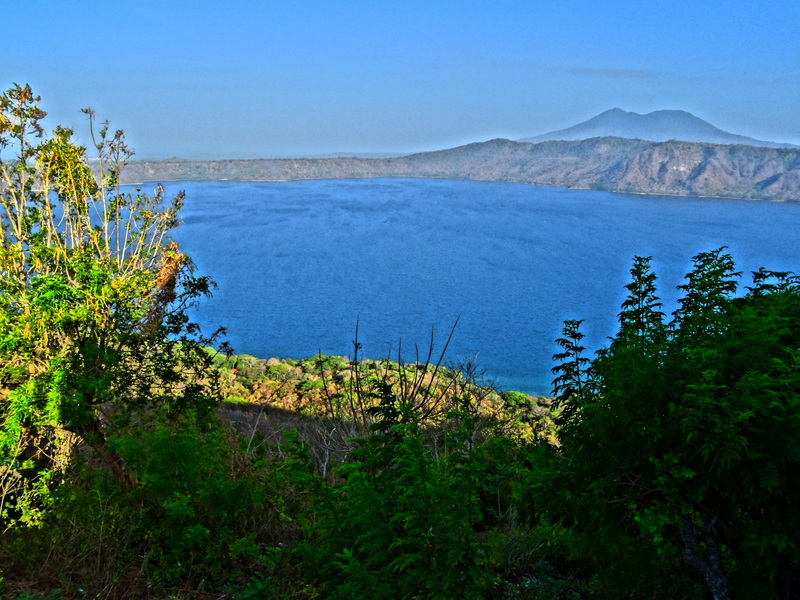 The Laguna de Apoyo is one of Nicaragua´s most gorgeous natural wonders. 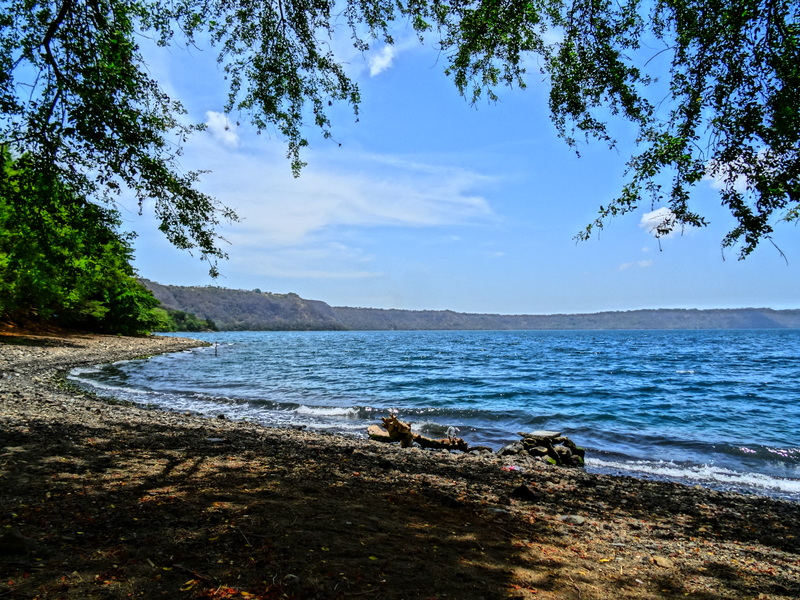 From Granada, take the local bus to Masaya, but you have to tell the bus helper in advance, that you would like to get out at the entrance of Laguna de Apoyo (and the natural area around the lagoon). The bus costs 15 C$. From the entrance to the lagoon, you can take a taxi or auto-rickshaw for about $3 per person. 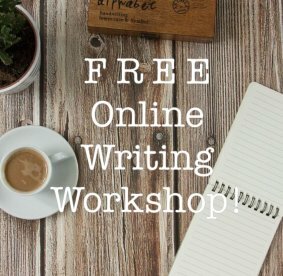 This will help you save a lot of money. Official transports arranged by hostels or taxis from Granada to the lagoon cost around $15-20, because it´s not that easy to get there on your own. We asked the taxi driver, to bring us to the hostel, “Monkey Hut”. 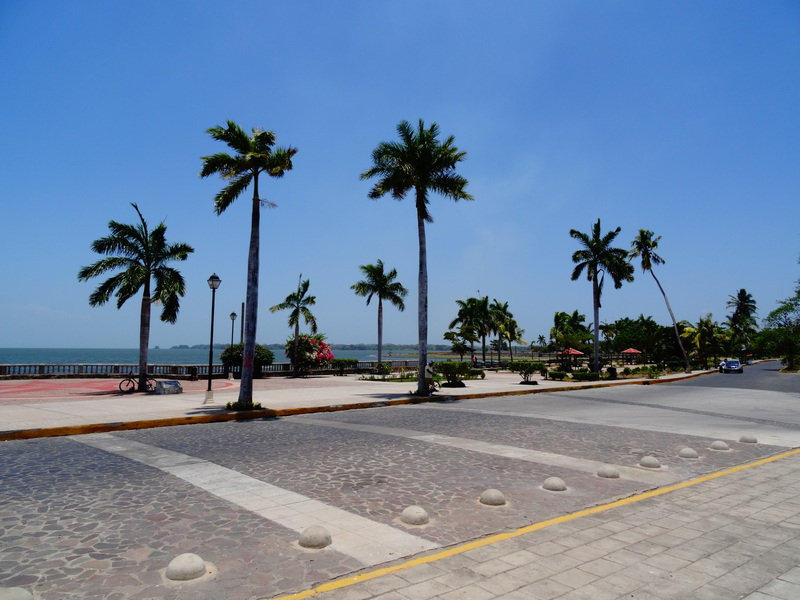 From there you can walk about 100 meters to the right side and you’ll find a public beach area, with many restaurants at the beginning, but if you walk a bit further, there will be just nature and some small houses. Warning: Don´t walk from the entrance of the area to the lagoon. Lately, there have been robberies reported! 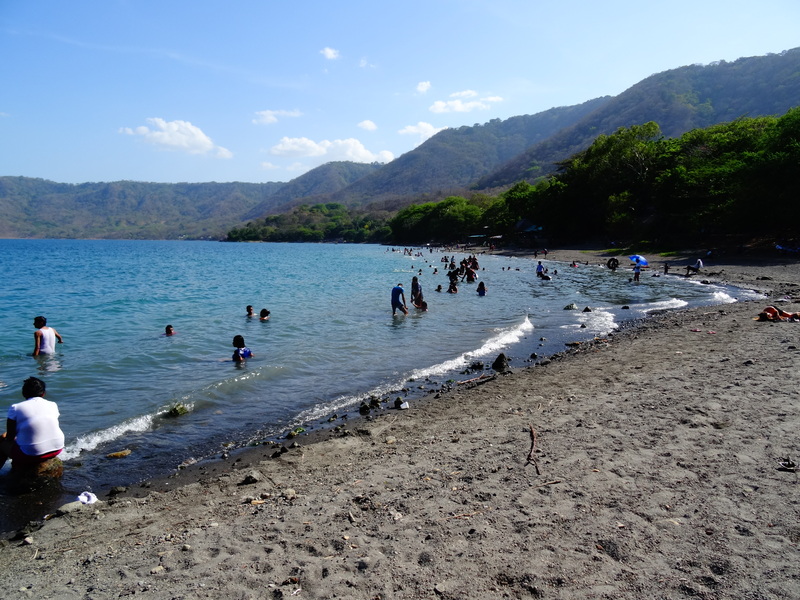 What can you do at Laguna de Apoyo? Find a quiet place and lie back! Enjoy the fresh and clean water, relax, and read a book. If you are feeling more active, you can rent a canoe and explore the lake. When we arrived, the lagoon was very quiet and almost nobody was there. Also the restaurants were very empty. But when we came back later to the “main beach”, in order to have a beer in one of the restaurants, the beach and restaurants were full of local tourists. 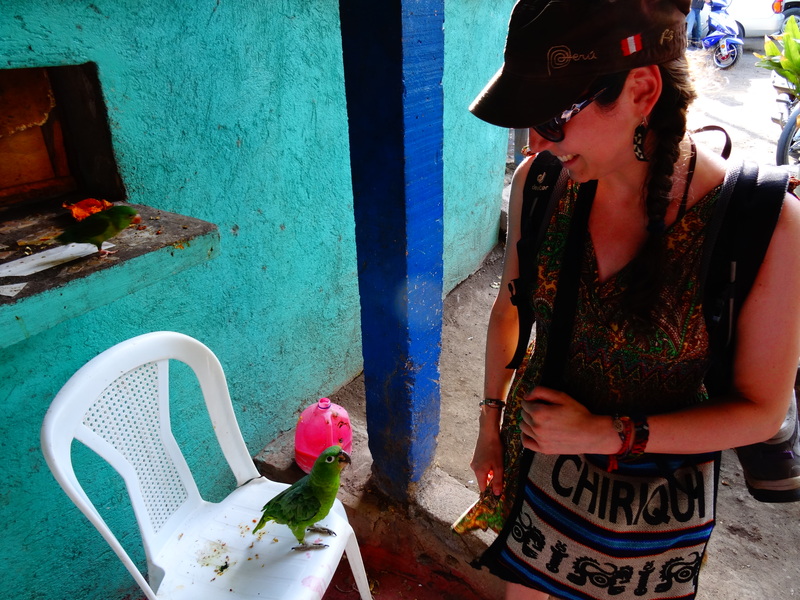 But we enjoyed our Toña and later I made a new friend. When we went back by auto-rickhshaw and had a stunning last view over the lagoon. Back at the main entrance (this time another one), Chris went back to Granada and I took the bus back to Managua and from there, I continued to León. Some gorgeous, refreshing and colourful last days came to an end! I did my Bachelor Degree in Business Administration/Marketing at the University of Pforzheim and my Master Degree in Integrated Natural Resource Management at the Humboldt University Berlin. 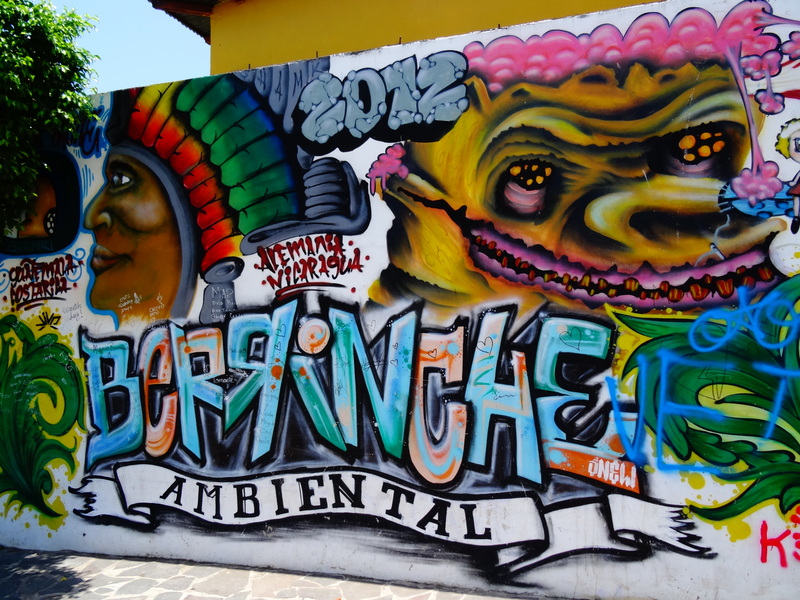 I’ve lived in Berlin, Karlsruhe, Hyderabad (India), Mumbai, Bangkok, Bogotá and León (Nicaragua), and currently I´m traveling around South America for doing volunteer work, that is related to my master studies (natural conservation, reforestation, agro-forestry, permaculture, biodiversity conservation, etc.). I love to travel in a sustainable and nature-close way, to discover other countries, cultures, traditions, and languages, and to learn more about our world and nature, and how to protect it, as best as I can.